This exhibition was formally launched by Anthony Albanese on Wednesday 4th April and is on until the 22nd April. The Glen Eira Gallery is open weekdays 10-5 and weekends 1-5. Anthony told those gathered of his favourite cartoons lampooning him, and his love of cartoons throughout his life. 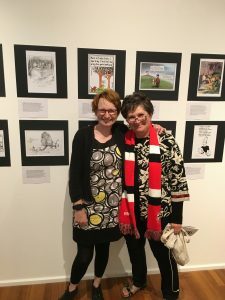 A friend and I popped in at the opening and found a wonderful selection of cartoons and cartoonists, from the Australian Cartoonists’ Associations (formally The Society of Black and White Artists). This group was established in 1924 in Sydney and has continued until this day. This turns out to be the largest ever exhibition of Australian cartoons, so it’s well worth a visit. There are pieces from artists born in the late 1800’s to current artists like Andrew ‘First Dog on the Moon” Marlton, Judy Horacek (who I had a fan-girl moment with), Leigh Hobbs, Jeff Hook, Bill Leak, Ken Maynard (remember all those cartoons in the Australian Post), Alan Moir, Judy Nadin, Pat Oliphant, Geoff Pryor, Peter Russell-Clarke, John Spooner, Ron Tanberg, Les Tanner, Dorothy Wall, Andrew Weldon, Cathy Wilcox and many more. So not only was I able to meet Judy Horacek (she is so wonderful she even gifted me a pack of her cards…perhaps to get away from me) and a photo, but I also met two gents Jim Bridges and Ian McCall who regaled me of tales of The Australian Cartoon Museum – Keeping Australian Cartoons Alive. Jim told me that they try to get copies of every cartoonist who has ever had something published in Australia. Lo and behold, I am told that they have a ‘Yvette Wroby’ file with pieces of my work published by the Australian Cartoonist Group from the 1990’s. Finally, I have a place to gift my collection of cartoon books and work. And another place to visit. The Museum is in the Docklands, Level 1 Wharf Street, Docklands District 3008 and is open 11-4 Wednesday to Sunday. If you know who has cartooned in Australia, or overseas, they can contact jim@cartoonmuse.com.